What you eat affects how you look and feel, so an anti-aging diet full of the right foods can go a long way towards looking and feeling younger. There’s no exact formula for an anti-aging diet, but there are a number of foods known to provide the body with what it needs to age healthily. In this post I’m going to present a several food ideas, and from there you can go off and build your own anti-aging diet. There are several types of foods you’ll want to have as staples in your anti-aging diet. The first of those is colorful fruits and vegetables — I’m talking about leafy greens, ripe red tomatoes, berries, carrots, and so on. I say the more color in your fridge, the better. The antioxidants in these colorful fruits and vegetables help stop unstable molecules from damaging healthy cells. In particular — vitamin C, zinc, and beta-carotene help protect your vision from macular degeneration, the leading cause of blindness. In addition, vitamin C can help keep your skin looking younger, and leafy greens have been known to reduce the appearance of wrinkles. Due to the number of benefits they provide, I recommend adding some colorful fruits and/or vegetables to every one of your meals, and having them between meals as snacks. Whole grains rich in fiber can lower your chance of developing type 2 diabetes. These types of grains can be found in food like oats, quinoa, barley, wheat, and brown rice. In addition, an anti-aging diet that includes lots of whole grains can also keep your blood vessels in optimal condition. I recommended aiming for 3 servings of whole grains each day. Avoid grains that you are sensitive to. Many people have gluten, corn and/or soy intolerance which can cause inflammation and age you. The best way to determine this is to do a complete elimination diet for 2 weeks and reintroduce the foods one at a time. An anti-aging diet should include at least a couple servings of fish per week because of the benefits provided by the omega-3 fatty acids found in fish. The fatty acids found in fish are actually good for your heart, and can also help lower your chance of having a stroke, and protect against Alzheimer’s disease. If you can’t eat fish, or just flat out don’t like the taste of fish, you could also look into adding fish oil supplements in your diet. Some people have sensitivities to dairy or are lactose intolerant. Dairy may not be your best source of calcium and vitamin D. Other foods have a more highly absorbable calcium. If you can’t eat dairy, or choose not to, alternatives like hemp milk and almond milk are also fortified with calcium and Vitamin D. I recommend at least three servings of high calcium foods such as green leafy vegetables, kale, broccoli, broccoli rabe, bok choy, figs, oranges, sardines, salmon, white beans, okra, and almonds. 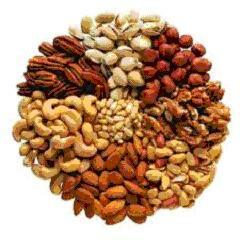 Like fish, nuts are full of heart-healthy fats that have been proven to reduce the risk of high blood pressure and high cholesterol. Don’t avoid nuts because the label says they’re high in fat — instead, eat more of them! Beans, being a plant-based protein, are recommended as part of an anti-aging diet because they can be used as an alternative to red meat, which is high in saturated fat. These recommendations are purely to be used as a starting point for creating your own anti-aging diet. I’m not saying your diet should include only these foods, but you should make an effort to include them in addition to what you already eat day to day.